Astronaut Scholarship Foundation > Astronauts > John L. Swigert, Jr.
John L. Swigert Jr. was a late addition to the Apollo 13 crew that struggled for more than three days to return safely to Earth after an oxygen tank explosion aboard the spacecraft aborted the mission as it approached the moon in 1970. Swigert was born August 30, 1931, in Denver, Colorado. He earned a Bachelor of Science in mechanical engineering from University of Colorado in 1953; Master of Science in aerospace science from Rensselaer Polytechnic Institute in 1965, and Master of Business Administration from the University of Hartford in 1967. He served with the Air Force from 1953 to 1956, including a tour as a fighter pilot in Japan and Korea. He then served with the Air National Guards of Massachusetts and Connecticut. Swigert was one of 19 selected by NASA in its fifth astronaut class in April 1966. He was named backup Command Module pilot for Apollo 13, and just days before the mission he replaced the prime command pilot, Thomas K. Mattingly, following Mattingly’s exposure to German measles. Swigert, Commander Jim Lovell and Lunar Module pilot Fred Haise blasted off for the moon on April 11, 1970. Lovell and Haise were to have explored the lunar Fra Mauro highlands while Swigert circled the moon in the Command Module. But they were forced to abort the mission as they neared the moon, more than 200,000 miles from Earth, when an oxygen tank in the Service Module ruptured, robbing the command ship of most of its power. They retreated to their still-functioning Lunar Module, and, working with ground controllers, converted it into a “lifeboat.” By conserving electrical and other supplies they made it safely back to Earth after a harrowing journey. Swigert resigned from NASA and between 1973 and 1977 he was executive director of the Committee on Science and Technology in the U.S. House of Representatives. In 1978, he ran unsuccessfully for the U.S. Senate from Colorado. He then held positions with BDM Corporation and International Gold and Minerals, Ltd., before returning to the political wars. On November 2, 1982, Swigert won the new seat to the U.S. House of Representatives from Colorado’s Sixth Congressional District, receiving 64% of the vote. On December 27, 1982, a week before he would have taken his seat in Congress, Swigert died in Washington, D.C., of complications from cancer. In 1997, the state of Colorado placed a statue of Swigert, in his Apollo space suit, in the Rotunda of the U.S. Capitol. 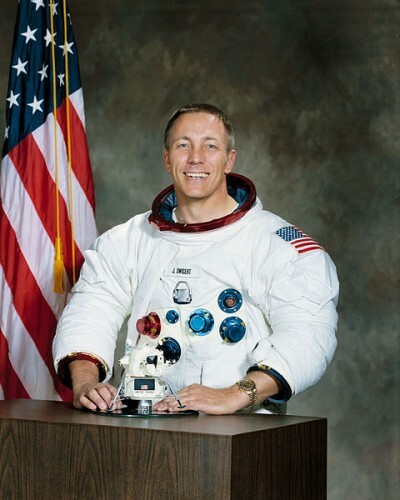 John Swigert was inducted into the U.S. Astronaut Hall of Fame on October 4, 1997.